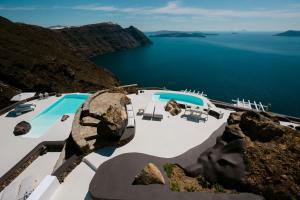 The Aenaon Villas is located in the highest and narrowest part of Santorini, right on the edge of the famous caldera, and opens to the four cardinal points, from east to west. This villa distributed in 2 levels is wide and includes a private pool, attic bedroom, living room with fireplace and bathroom with shower. Offers a large secluded porch with views of the caldera. This villa can not accommodate extra beds. Spacious villa with living room, living room with kitchen, bathroom with shower, fireplace and private veranda overlooking the Aegean Sea. Spacious villa with living room and dining room, bathroom with shower and large private veranda with incredible views of the caldera. Large villa with a master bedroom and 2 additional bedrooms, large kitchen, large living room, fireplace and spacious porch on the same level as the pool and overlooking the caldera. Large villa with living room, bathroom with shower, fireplace and porch overlooking the caldera.